Defined as a means of expressing abstract ideas through a combination of symbols and personifications in an extended metaphor, allegory was developed by the philosophers and writers of Classical antiquity. The word derives from the Greek term allegoria — “to speak of something under the guise of something else.” In fine art, the objects, persons, and actions depicted refer to meanings (whether moral, social, religious, or political) beyond the literal, figurative representation. Secular and political allegories during the medieval period often involved figurations of Justice, Injustice, Peace, Fortune, time, and the seasons, but Renaissance and Baroque art revitalized such allegories with a renewed interest in Classical conventions and myth. 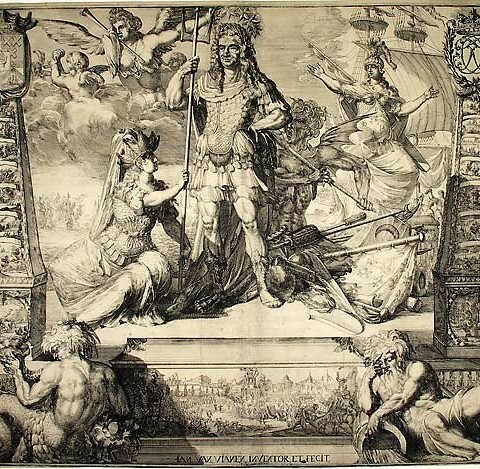 Frequently, artists combined stories and figures from antiquity with the Christian allegorical tradition, as in Matthaus Greuter’s engraving after Wendel Dietterlin the Elder’s Power of Venus: Allegory of Lust and Purity. 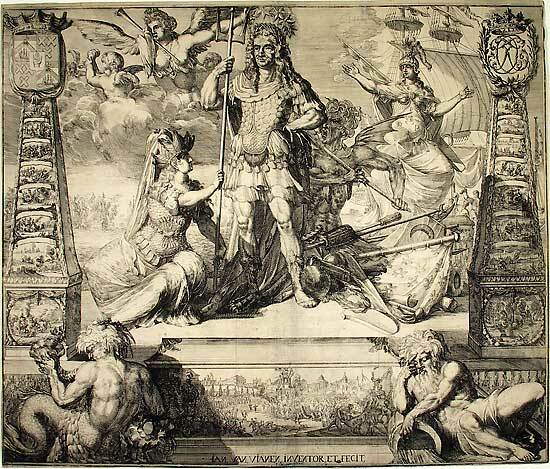 In addition, mythological motifs were used in self-aggrandizing allegorical personifications of political figures, as in the case of Jan van Vianen’s Cornelis Tromp (Allegorical Portrait as Neptune). By the late eighteenth century, the use of allegory waned as it was subjected to both aesthetic and philosophical critique. Even so, illustrations like William Blake’s Europe Supported by Africa and America made use of allegorical personification to represent dense political relationships in simplified (and perhaps ironically romanticized) visual terms.